Having blogged Tamil Nadu/Kerala style parotta and chicken salna, its now time to bring to you an irresistible street food of Tamil Nadu that combines both of them in a mish mash of sorts. I am talking about Kothu Parotta. Kothu Parotta is prepared with mixed vegetables that include carrot, beans and green peas, egg kothu parotta calls for scrambling eggs while chicken kothu parotta has chicken pieces with salna gravy going into it. Whatever the variation, I can tell you that it is a hard to resist fast food. Kothu means ‘minced’ in Tamil where the small strips of soft and flaky parottas are coated with a medley of spices and salna (gravy) and pounded into a mince using the edge of a flat spatula. 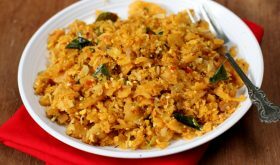 Egg Kothu Parotta or Muttai Parotta is prepared with shredded parotta that is tossed in a sauteed onion-tomato spiced mixture, scrambled eggs and salna. In most restaurants it is served with raita but you can savor the dish without any accompaniment. Its a meal on its own, very filling and full of flavor. 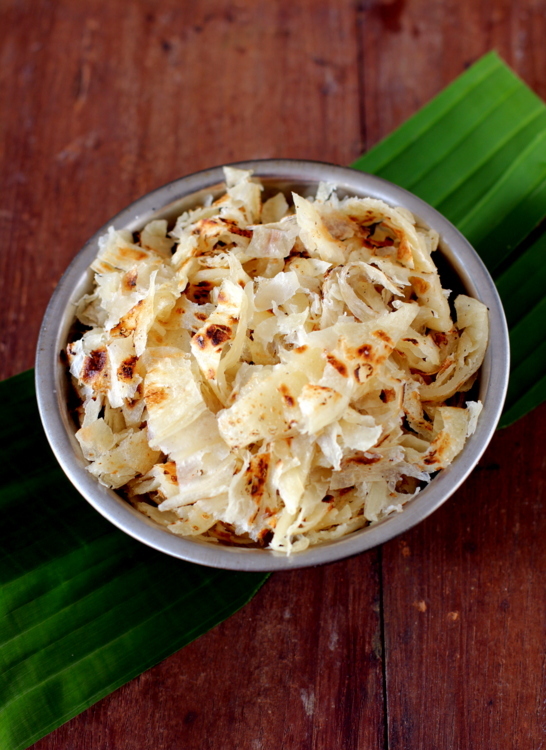 To learn more on how it is prepared in restaurants and street food hawkers, do watch the video of Egg kothu parotta recipe. 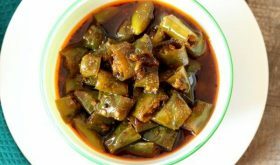 Heat oil in a heavy bottomed vessel, add the curry leaves, green chilies and chopped onions and saute on medium flame for 4 mts. Add ginger garlic paste and chopped stalks of coriander leaves and saute for 3 mts. Add red chili powder, turmeric powder and mix well. Add chopped tomatoes and saute for 4 mts. Make a well in the center and pour the egg mixture and scramble it till almost cooked. Mix the contents of the vessel such that the scrambled eggs mix well with the onion-tomato mixture. Add the shredded parotta and salna and mix well. The contents should be minced with a pounding action using the end of a flat spatula. Cook on medium flame for 4 mts tossing the contents well. Add garam masala, lemon juice and chopped coriander leaves and mix well. Turn off flame. Remove to a serving bowl and serve warm. You can add a few chicken pieces without bones along with salna and this variation is called Chicken Kothu Parotta. Vegetarians can add mixed vegetables like chopped carrots, beans and green peas and use vegetable salna. By Sailu Published: December 23, 2013 Kothu Parotta, a popular street food of Tamil Nadu, is made with parotta, eggs and salna (chicken gravy). 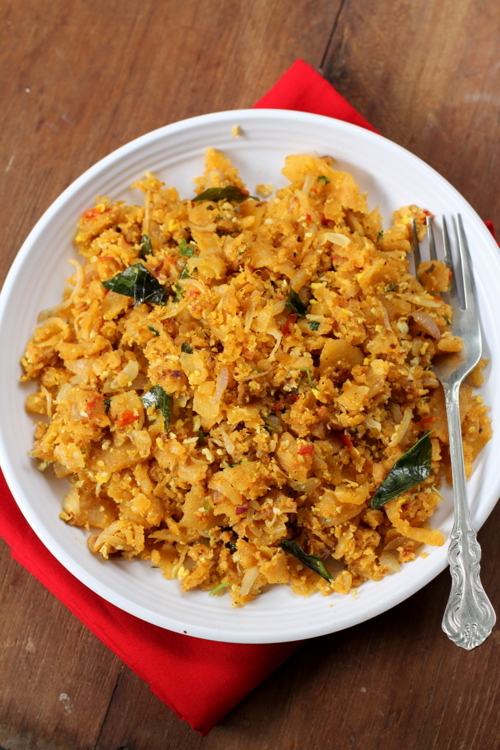 Also known as Muttai Parotta or Egg Kothu Parotta. Oh My Gosh! It’s Indian Migas! In Mexican cooking, we do the same thing (minus the mincing on the griddle) but use old corn tortillas instead of paratha and add cheese, and it’s sonderful. Try it sometime and I will be making this for all my Mexican friends so they can see how it’s done on the other side of the world. Thank you again, Sailu!!!!!!!!!!!!!!!!!!!!!!! Gravy dish prepared with either vegetable or chicken. since some of the ingredients from this recipe are the same in the chicken salna recipe, do we skip any ingredient or lessen the amount of some?